When Wifey and I decided to get our first dog, we knew we wanted to adopt one from our local RSPCA. There’s no doubt it’s a huge choice and we even used their website survey to work out what breed would be best for us (a beagle, which is exactly the opposite of what we got). Then we hit their website and trolled through the photos, oohing and aahing over the online profiles. We spent a few weekends going in to the kennels, walking past the hopeful adoptees and walking out again, unsure about what we wanted. Everytime I walked out without a dog, it broke my heart to think that there were so many in there looking for new homes – a home that we didn’t think we could give. We continued this for weeks – me checking the website, emailing profiles to Wifey with “Could this be our Lola?” (the name Wifey was determined to call our dog, so we were predestined to get a girl). 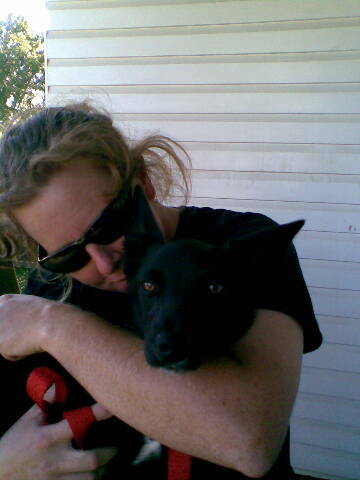 During this time, a little 5 month old kelpie-cross came up. 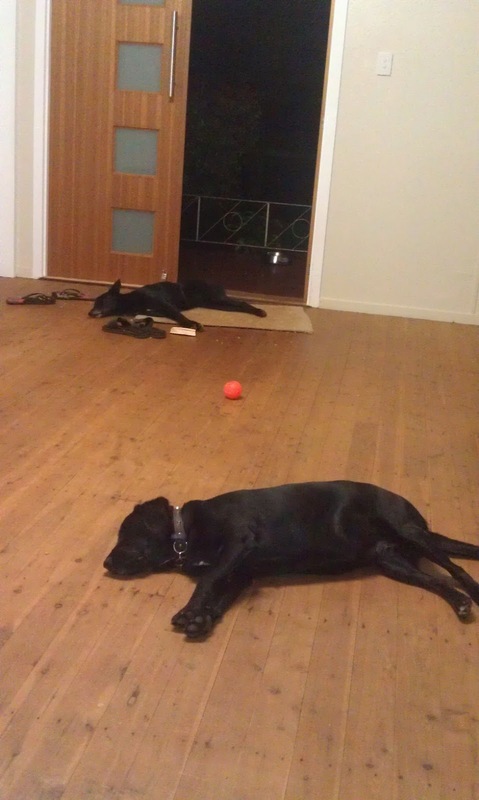 We glossed over her profile for weeks – she was gorgeous, but we figured we preferred a more sedate type of dog. Kelpies are working dogs, and notoriously hyperactive. We came close with a golden retriever called Magic, but when we took him for a walk he was more interested in being out in the park than he was in us. We also found out that he was a master of escaping yards. Thankfully though, he found a home with a family with kids, which was perfect for him. Finally, after a few months of looking, I opened up the little kelpie’s profile, and had a really good look at her picture. She was a tiny, skinny little thing, and jet black. Her tongue lolled out the side of her mouth and her ears pointed straight up and alert. I suggested to Wifey that we might get her out for a walk when we went back to the RSPCA that weekend. Wifey agreed, because it was the one profile she kept coming back to as well. What could it hurt? That weekend, we walked straight up to her kennel and spoke to her. I can’t remember what we said, but Wifey probably said something like “Do you want to come home with us?” We should have known right then that she was the one – she leapt at the wall and flipped off it. Wifey and I stepped back and said “whoa!” We knew we might have an excitable puppy on our hands. We also wondered what she’d be able to do off our six-foot fence. Undeterred by her acrobatic abilities, we asked a volunteer if we could take her out to have a play with her. When we first stepped into the yard, the volunteer took off the leash, and I knelt down to the kelpie’s level. She walked straight over to me and put her head under my armpit, resting her chin on my leg. I looked up at Wifey and smiled. This kelpie was the one. We played with her for awhile, but in all honesty, we didn’t need to make our minds up – she’d picked us, so we figured we better just formalise the adoption and take her home. While we were there playing with her, we had a few of the volunteers and staff come up and say how happy they were that this little kelpie had found a home at last. She’d been in the kennels for nearly three months, and no-one had shown much interest. They all fussed over her and said she was a beautiful dog. We can certainly attest to that. So, after signing the paperwork and paying the adoption fee, Daisy became the first addition to our family. I always say that Daisy chose us, rather than the other way around. I’d like to think that she waited until we came along to show us her best side so that we would be the ones to take her home. Early on when my writing was just a hobby, I wanted to reach the world. I wanted ‘everyone’ to read and love my work. Since then, I’ve realised that not everyone’s going to like what I write, and that’s ok.
My job is to be my best self. To write what I’m passionate about. To write in my own unique way. Sure, lots of people might come and have a look, but they’ll keep smiling and walk right by, knowing my stuff just isn’t for them. But just like Daisy, if I’m true to myself and write what I love, the right people will come along. We always knew we wanted two dogs, because we didn’t want to have a lonely dog on our hands, since both of us work full time. Our other dog, Ruby, is a rescue pet from the same RSPCA we got Daisy from. I’ll tell Ruby’s story in a future post, because she taught me things only a Labrador could. And if you’re after a dog, cat, rat, chook, or other type of pet please consider your local RSPCA or shelter.